The last couple of weeks have been super busy, with the posts, trellises and wires going into the two blocks that were planted last year. We've had great weather so far in February and March. The original load of vineyard supplies. 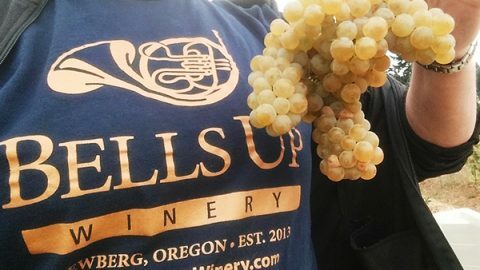 Of course, after the materials arrived, we learned that half of the supplies we ordered were not what our vineyard crew actually wanted to use. They soldiered on with what they could use, and sent the CMO back with returns and exchanges. The first few end posts appeared on the east side of the Pommard block. More end posts, heading west. The first end posts in on the north side. A few vine and end row adjustments were made, then the crew started pounding in the posts. Precision anchor placement for the end post wire. Apparently there is a mechanical tool for burrowing anchors in the ground, but unfortunately it was not available. So these amazing guys sank every anchor by hand! There was a lot of synchronization involved in lining up and pounding the posts in. A few days later it was time to start running the anchor, permanent and trellis wires up and down the rows. All that meticulous attention to detail paying off with this cool view. A whole new meaning to walking a wire. Each reel of wire was fed off a spindle planted temporarily in the ground. More wires, this time a shot of the 2nd block of vines, 667 west side. We also had our newest, and third, block planted with 270 seyval blanc vines. 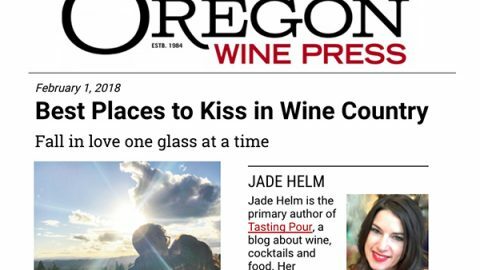 We believe these are the first and only planting of this varietal in the Willamette Valley–although we have heard they are not the first in Oregon. We hear there is a plot of seyval blanc in the southern part of the state. This planting is located on the far west side of the property, the area we cleared out shortly after moving onto the site two years ago. What we believe to be the first and only seyval blanc vines planted in the Willamette Valley. Post planting, the baby seyval blanc get the blue tube treatment too. Because there are only 5 full rows of seyval blanc vines, we went ahead and had the crew trellis them as well. 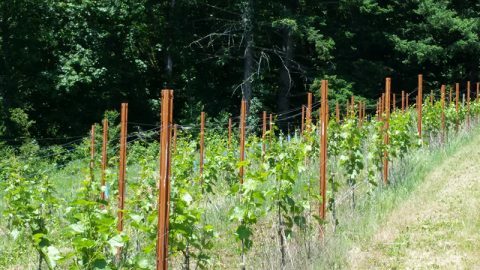 Adding the posts was not necessary this year, but it made sense to max the vineyard crew's time. Stay tuned for out next post with the latest winery/tasting room developments! We're the newest member of the Willamette Valley Wineries Association...Fine tuning the echo.